The subway ride to the Bronx felt endless. I usually rode to the house in Morris Heights with Frisner, but his van had gone ahead of me four days earlier. Since then it was marking time and waiting for its owner outside Kay Mano: the home of Mano Cadet. A small chamber within the bosom of the house now held Frisner in seclusion, leaving me to ponder the mysteries of Vodou from the outside. Now, I passed the time on the number 4 train chatting with photographer Chantal Regnault about the coming-out party we were about to document. For some reckless reason, I had placed a tote bag on the floor at my feet. The subway doors opened a few stops before ours; the man sitting across from me seized his opportunity. Out he went with my tote, just a microsecond before the doors closed. Bummer! But the good news was that my little audio recorder was not in that bag. I could still capture the exuberant sounds of Frisner’s initiation party. Did anything else matter? 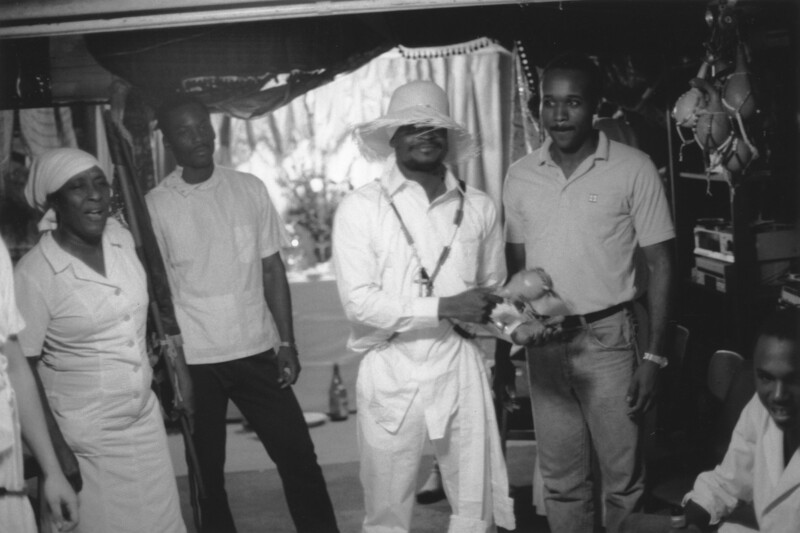 The Vodou spirits had chosen Frisner when he was still a youth in Haiti. Warrior spirit Ogou, in particular, ordered that a society located behind the Grand Cemetery of Port-au-Prince initiate him as one of its drummers. Vodou, however, can be a university, with multiple grades to pass; each grade carries its own level of knowledge and requires its own initiation. Mano, whom Frisner knew from the community behind the cemetery, was now a full oungan (male priest) in New York. 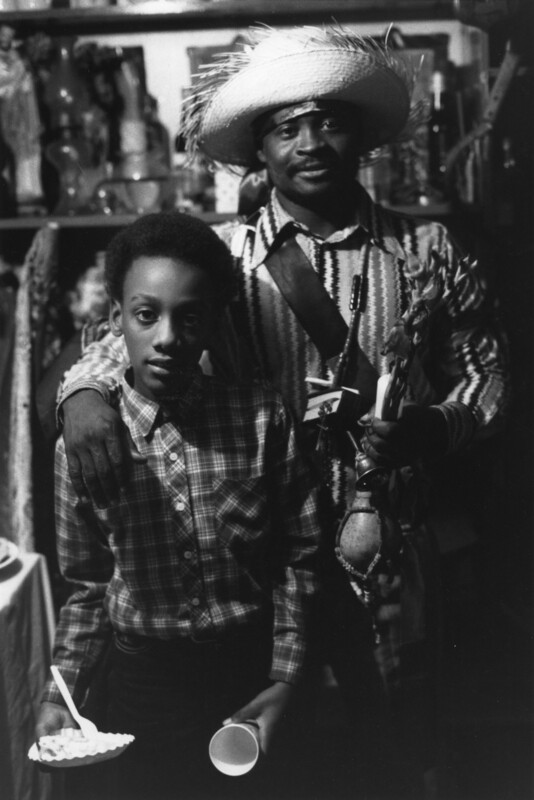 He helped pioneer Vodou in the diaspora by establishing a society in the Bronx. Frisner connected with him shortly after his own arrival in 1972. Now the spirits called again, and Frisner would move to a grade called oungan sou pwen (on the cusp of the priesthood). Mano would initiate Frisner and two other candidates. In Haiti the full initiation process (kanzo) entails rites for sending you into the initiation chamber (djevo); eight days in seclusion; and a celebratory coming-out party with drumming, song, and dance. Cognizant of the markedly different lifestyle we follow in New York, Mano tailored his kanzo, requiring that you spend only four days in seclusion. The coming-out party always happened on a Sunday afternoon. Following opening prayers and chants, you left the djevo and entered the public space. You wore white, and the brim of a straw hat covered your eyes. When the oungan lifted your brim, you were a bit like a baby opening her eyes for the first time. The oungan officially baptized you, and then you changed into a multicolored outfit and received the hugs and kisses of friends and family. Thanks to chance, or perhaps divine intervention, my audio recorder escaped the clutches of a thief on a train. The Frisner Augustin Memorial Archive offers more, and more, and more. We continue to digitize analog documents for our online archive. If you are so inclined, please visit our Memorial Archive page to learn more, and to participate via a tax-deductible gift. This can be your contribution to building a history of Haitian arts and culture in New York City. Thank you in advance for your help! 1. Frisner emerges from the djevo with the ason, the sacred rattle of the priesthood. 2. 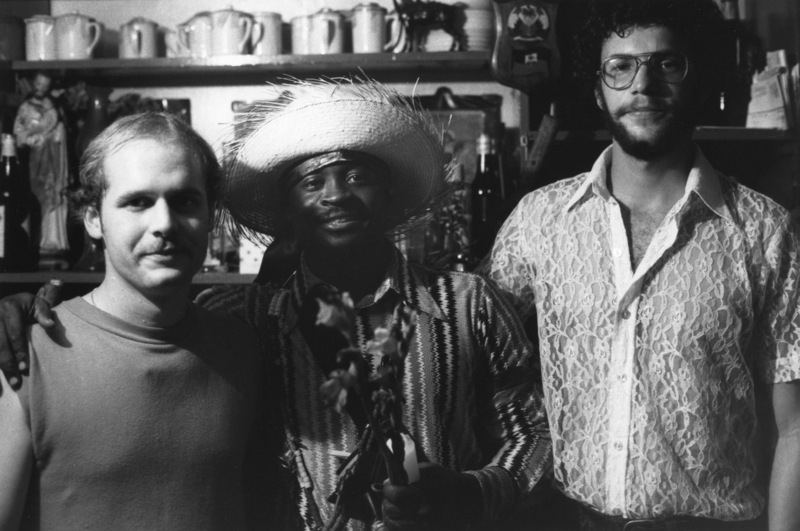 Frisner poses with drummers Steve Deats (left) and Steve White (right). 3. Frisner poses with his son, Gregory Augustin. M swete Frisner. Media anpil pou kontinye Bon travay. Bel mizik, bel chante!